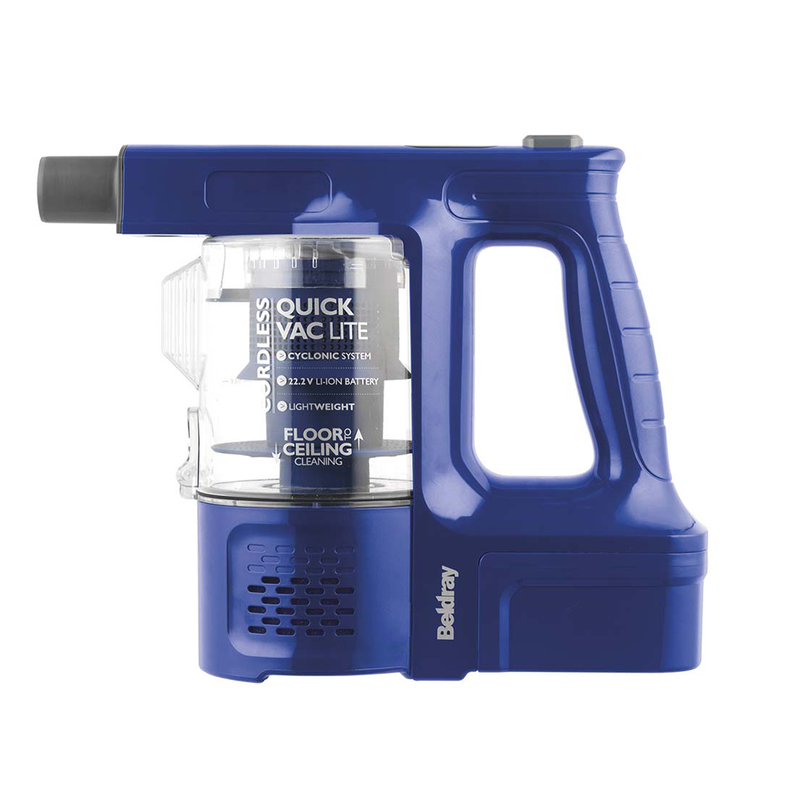 If you are short of storage space or simply dislike using heavy upright vacuum cleaners, this lightweight and compact Beldray Quick Vac Lite is the perfect choice. 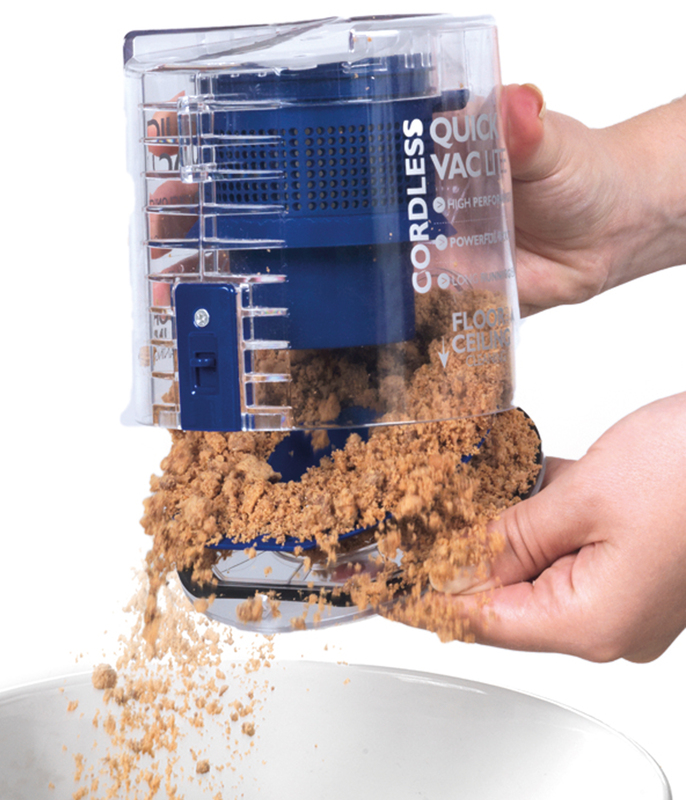 With a high efficiency motor and a washable filter, it provides powerful cleaning and quickly collects any dirt in the 500 ml tank. 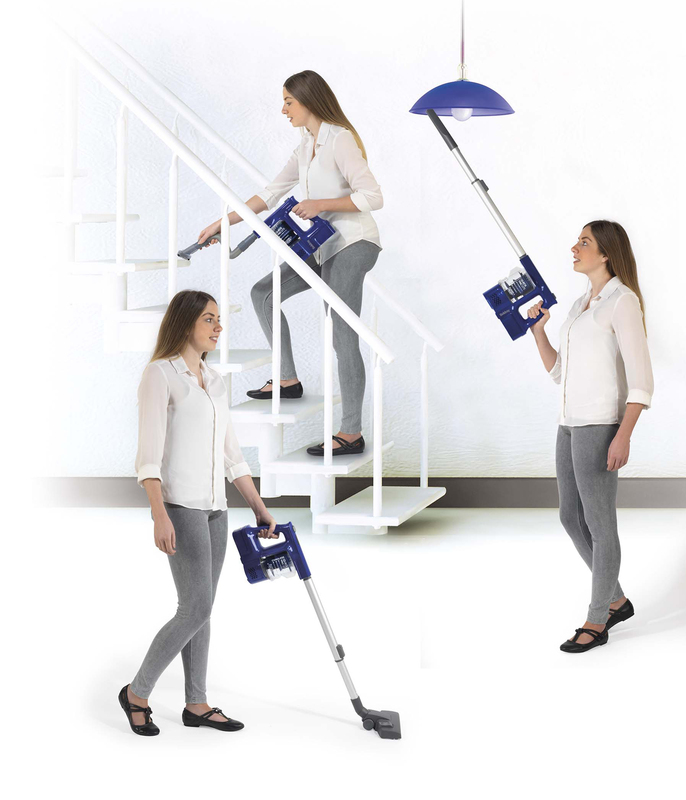 Handheld and rechargeable, it has an extendible hose and a 22.2 V battery which retains power for longer with up to 25 minutes operating time from one charge so you can enjoy fast, cordless cleaning. 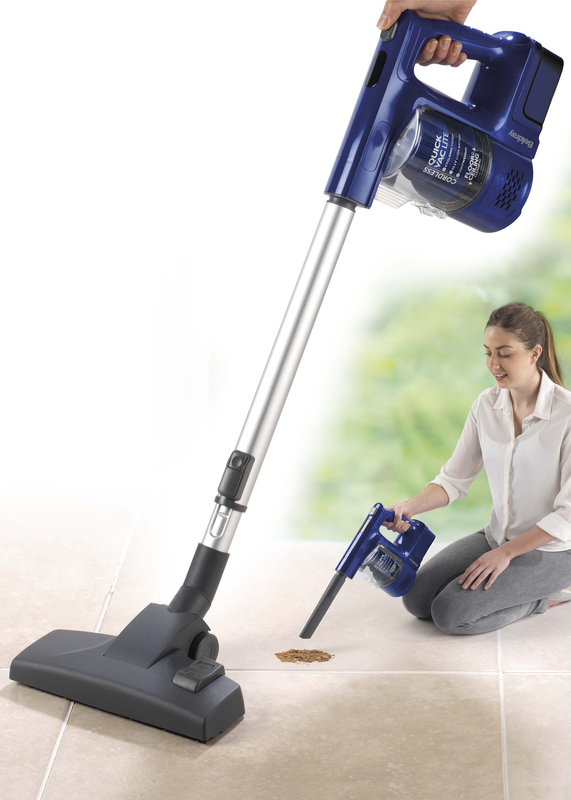 The Beldray Cordless Quick Vac Lite has an ergonomic design and dual cyclone technology to provide brilliant floor to ceiling cleaning. It comes with attachable crevice and brush tools, as well as an extendible tube which allows you to clean high or low with ease. 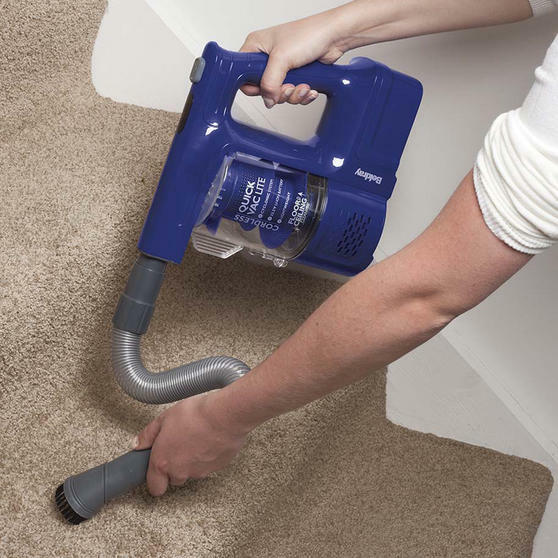 With powerful suction and a 500ml dust tank, it can pick up even small bits and has a high efficiency floor brush for a better clean. Measuring just 24.7l x 11.7w x 24h cm, the vacuum cleaner is perfect if you are short of storage space as it can simply tuck away. I have one of these and find it works well on my wooden floors and with brush up on rugs. The only slight quibble I have is that it 'clogs' up quite quickly with dust and dog hairs clogging the area where the holes lead to the filter. I empty after every use and clean filter regularly but still find this problem. I am looking ot order a second filter to use when I wash the one I have. excellent all round appliance. Battery life enough to do a standard home in one go. Light and easy to use in any mode.Easy clean. Picks updust no problem but find difficulty removing HEPA filter to clean. We too like this nifty vac, however like Pat Milligan think it clogs too easily and want a second filter to use while we wash one. Please advise how we can do this. WE HAVE THIS VAC FOR A YEAR NOW, LIVE IN A TWO STORY HOUSE,AND CAN VAC ALL ROOMS ON ONE CHARGE.TO REORDER A SECOND FILTER THERE IS A PHONE NUMBER AND MAIL ADDRESS ON THE BOTTOM OF THE VAC. WE ORDERED A SECOND FILTER AND CHANGE IT EACH TIME WE USE IT, WASH ONE AND LEAVE IT TO DRY. BRILLIANT VAC. 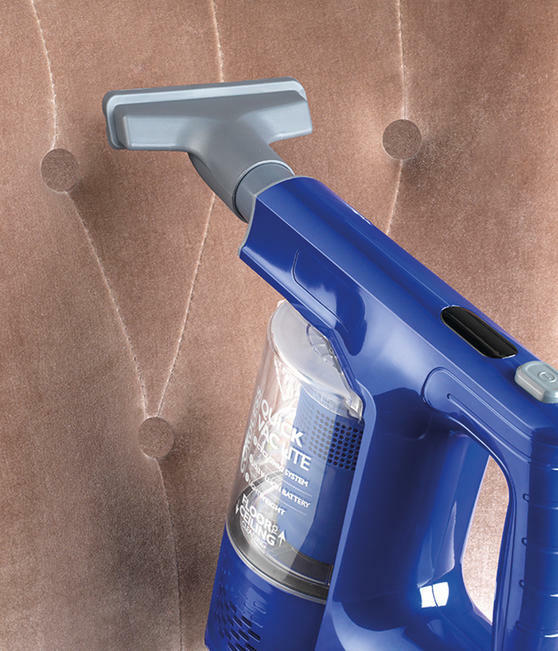 A great vac.Light,very comfortable to use and very good pick up of hair and dust.The best way to keep this vac in good order is to empty it after every use. 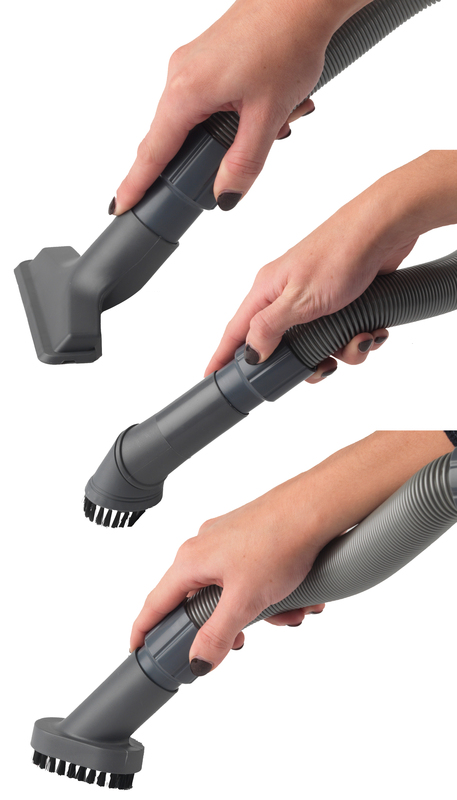 Cleaning the filter is very easy and only takes a few minutes.The brush bar needs to be decloged but that is very easy to do.Charge after each use and it will be ready to serve.Great Vac.Buy,Buy,Buy. Love this Vac. Its powerfull, light and the battery last long enough (even on turbo vac). It picks up all the dirt and cleaning is really easy. Would love to have a second filter. I did sent Customer Support an email about buying a second filter. Would be great to change the filter while the otherone is drying after cleaning. Beldray 22.2V Cordless Quick Vac Lite I've had this excellent little machine for some years now - much more convenient to use than my corded upright although obviously not as strong. Regarding the filter, I realised I could save a lot of drying time by simply vacuuming the filter using the nozzle cleaner on my old upright: it takes just a few minutes and then you don't have to wash it at all. Just one warning though: the slight abrasion necessary to release all the fluff and stuff from the filter can gradually wear out the foam. For this reason I am now on my 2nd filter - but the first did last a number of years. I too am seeking a replacement filter to have ready for 2 or 3 years ahead. Bought today, first charge and hovered upstairs this evening. Have to say I'm impressed as it filled to containers. I would recommend purchasing one..
A great vac.Light,very comfortable to use I too am seeking a replacement filter. Is it possible too order this and ship this too the Netherlands?